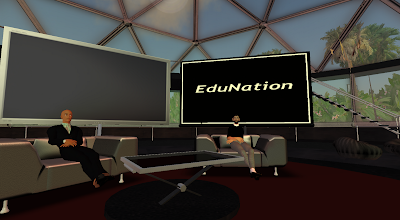 Sunday 26th April 09 (GMT 18.00 = 11.00 PST) will see the next in our series of 'Coffee With ..' educational chat shows on Edunation II in Second Life, so please do come along, join our audience and meet other people interested in developing education and learning within Second Life. In this show I'll be interviewing, writer, trainer and ELT guru Scott Thornbury. Scott's writings and often controversial opinions have had a profound effect on the face of ELT and continue to influence many EFL teachers and trainers around the world. His writing credits include several award-winning books for teachers on language and methodology. He is also series editor for the Cambridge Handbooks for Teachers (CUP). 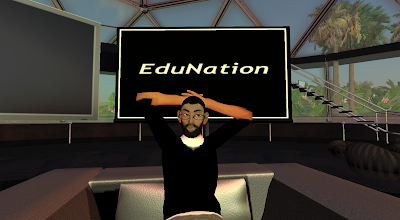 He was also the co-founder of the dogme ELT group, whose archived website, called Teaching Unplugged, can be found here. Scott is currently Associate Professor of English Language Studies at the New School in New York, where he teaches on an on-line MATESOL program.